Since being founded in 1902, Palmerston North Boys’ High School has catered for a diverse range of students because they come from a wide cross-section of families, and are selected without regard to social, economic or cultural factors. Palmerston North Boys’ High School wishes to maintain that balance. The Board of Trustees believes that the resources provided by Palmerston North Boys’ High School will support an optimum roll of approximately 1700 students. This is the number of boys which the school’s site, classrooms and shared facilities such as hall, library, gymnasia, swimming pool and outside area can reasonably be expected to accommodate. Click on the lists below to read more about the School Zone. All students who live within the home zone described below (and/or shown on the attached map) shall be entitled to enrol at the school. In the event of a ballot, the Board will determine the number of places which are likely to be available in the following year for the enrolment of students who live outside the home zone. A notice will be published stating how applications are to be made and will specify a date by which all applications must be received. First Priority This priority category is not applicable at this school because the school does not run a special programme approved by the Secretary for Education. Second Priority will be given to applicants who are siblings of current students. Third Priority will be given to applicants who are siblings of former students. Fourth Priority will be given to any applicant who is a child of a former student of the school. Fifth Priority will be given to applicants who are children of board employees. If there are more applicants in the second, third, fourth, fifth or sixth priority groups than there are places available, selection within the priority group will be by a ballot conducted in accordance with instructions issued by the Secretary under Section 11G(1) of the Education Act 1989. Parents will be informed of the date of any ballot by notice in a daily or community newspaper circulating in the area served by the school. Applicants seeking second or third priority status may be required to give proof of a sibling relationship. This will be done as per the “Administration Details for Enrolment Scheme”. The school maintains a boarding hostel for boys, College House. Applications for admission as a boarder will be accepted at any time and should be made directly to the Manager, College House, PO Box 4049, Palmerston North, 4442. Students accepted as residents of College House will automatically be enrolled at Palmerston North Boys’ High School. The description of the Home Zone begins on the corner of Botanical Road and Featherston Street. All homes within the following described area form Palmerston North Boys’ High School Home Zone. From the corner of Botanical Road and Featherston Street the Home Zone includes all houses on the northern side of the street or left hand side of the road travelling towards Palmerston North Boys’ High School. It includes houses on the corners of Birmingham Street, Seddon Street and finishes at and includes 113, Flats A to E. Houses on the southern or right hand side of the road traveling towards Palmerston North Boys’ High School on Featherston Street are all excluded from the zone. The zone then travels down Pascal Street and all houses on the left hand side (eastern side) of the road are included in the zone and all houses on the southern side or right-hand side of the road are excluded, including the house on the corner of Pascal and Featherston Streets. From Pascal Street the zone turns left into Cuba, excludes any properties on the right hand side of the road, and includes, on the left hand side, Arena 1. The zone turns right into Cook Street and includes all properties on the left hand side of the road, including properties on the corners of Willis and Main Streets. Excludes all properties on the right hand side (eastern). 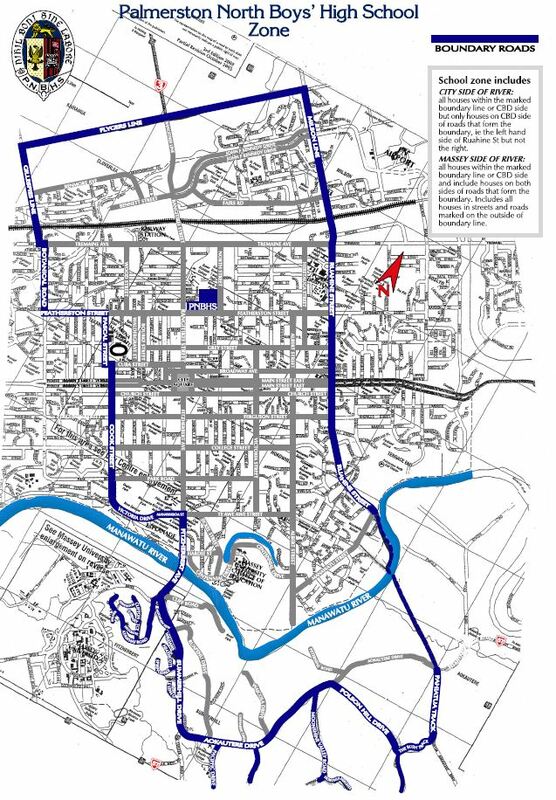 The zone travels the length of Cook Street, through Main Street, Church Street, Ferguson Street and College Street and the entire length of the street. Houses on the left hand side (western) of the street are included in the zone and houses on the right hand side (eastern) are excluded from the zone. Properties on the left hand corners of Cook Street are included in the zone. This includes properties on the corners of Just Place. Turn left into Park Road and immediately right through the Victoria Esplanade and exit the Esplanade into Manawaroa Street. Houses on the left hand side are included in the zone including the houses on the corner of Manawaroa and Graham, both sides. The zone then turns right into Fitzherbert, excluding houses on the right hand (western) side of the street. All properties on the left hand (eastern) side of the road from Wallace Park up towards the Fitzherbert Bridge are included in the zone. The zone travels across the Fitzherbert Bridge and includes all streets that lead off and include Summerhill Drive – (Mountain View Rd, Williams Tce, Heathcote Pl, Springdale Gr, Kea Pl, Lalena Gr, Ruapehu Drive, Kilkenny Pl,The Strand, Sycamore Gve) and Atawhai Rd – (Clifton Tce, Hillgrove Pl, Guernsey Pl, Fernwood Pl and Keiller Pl) The zone includes Aokautere Drive, and all streets that lead off it –( Ruapehu Dr, Cashmere Dr, Waicola Dr, Petersens Rd, Pacific Dr, Moonshine Valley Rd, Whiskey Way, up to and including Polson Hill Drive, The Bush Track) and loops back onto State Highway No 57 (Pahiatua Track) back to the intersection of Aokautere Drive and Fitzherbert East Road. The zone then crosses the Manawatu River and includes all houses on the city side of the river up to the end of Ruahine Street. On the entrance to the river walkway and Bridal Track on Ruahine Street the zone then travels the length of Ruahine Street, excluding houses on the right hand (eastern) side from number 497, and includes all houses on the left hand side. All houses on the corners of Newcastle, Swansea, Franklin, Luton, Ferguson, Church, Main, Broadway, Grey, Featherston are included in the zone. All houses on the right hand (eastern) side of Featherson Street are excluded from the zone. The zone extends across Tremaine Avenue, including the property on the left hand corner of Tremaine Avenue and Ruahine Street, number 753 Ruahine and continues over the Milson Ramp, continuing to exclude all properties on the right hand (eastern) side of the road. Properties on both corners of Fairs Road and John F Kennedy Drive are included in the zone. The zone continues to travel the length of Milson Line and extends to Flygers Line. The zone turns left into Flygers Line and includes all properties on the city side (southern) of Flygers Line. Properties on the corner of Gemini Avenue are included in the zone. Properties on the Feilding side of Flygers Line are excluded from the zone. The zone travels along Flygers Line and crosses Rangitikei Line and continues to include properties on the city side of Flygers Line and exclude properties on the Feilding-Sanson side of Flygers Line. At the end of Flygers Line the zone turns towards the city in Gillespies Line and includes all property on the city (eastern) side of Gillespies Line. The zone excludes all properties on the right hand (western) side or boundary of the city.